Bayern München’s fanclub Red Dragons London form the Südkurve here in London! Founded in the summer of 2013, the official FC Bayern fanclub has emerged to become London’s – and the United Kingdom’s – premier fan club of the worlds greatest football club! 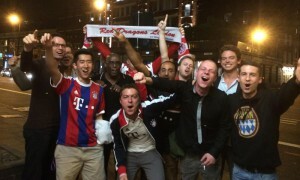 Red Dragons London is an official Fanclub of FC Bayern München. We are a group of more than seventy people who genuinely enjoy watching football and supporting FC Bayern. The aim of the club is to provide an environment for all fans in the Greater London area to support our club. As an FC Bayern registered fan club Red Dragons London aim to meet regularly to watch the FC Bayern matches in our designated Stammlokal – the Bavarian Beerhouse, which has two venues near Old Street and Tower Hill. We also organise regular annual events such as grill or end-of-season parties. In addition as a registered fan club of FC Bayern Red Dragons London are entitled to apply for stadium tickets and organise tours to selected events. Since matches are usually oversubscribed there is no guarantee to receive tickets, but fan clubs are often preferred so that Red Dragons London have in various instances been lucky to procure tickets. Our close links to other fan clubs also allows us to obtain additional tickets if available. As the distribution of any tickets will often depend on the timing and status of the match there is no guarantee as to availability and numbers, but we will always try to get as many as we can for our members as well as close friends – with allocations being made using our bonus points system and ballot. Along the lines of “Mia san mia” we maintain good terms with other supporters and Red Dragons London has good relationships with major German and international fan clubs. The club strives to meet other clubs as often as we can. As a club member we identify ourselves with Red Dragon gear specifically designed for the club. On our website you will be able to find out everything you need to know about the Red Dragons, and what we are up to. From member biographies and news on our special upcoming events through to photo galleries from our travels, there is plenty to discover. You will also be able to follow the team with regular match reports from Red Dragons board member and resident reporter Rick Joshua who provides an honest “fans’ view” of every FC Bayern game.